- Publisher Responding to the current preoccupation with assisted suicide, the author discusses society's moral confusion over the meaning of death and gives a Christian alternative consistent with traditional ascription of value to human life. - Publisher In the past several years our culture's long-standing prohibitions against suicide and euthanasia have been seriously challenged. A great tidal change in morality and law may be occurring as the courts seem to be creating a new right - the individual's right to die. In the fall of 1994 the people of Oregon voted to legalize physician-assisted suicide; Michigan's courts continue to acquit Dr. Jack Kevorkian for his involvement in the deaths of more than two dozen patients; and in several states federal appeals courts have struck down statutes that prohibited physician-assisted suicide. In Life's Living toward Dying Vigen Guroian responds to this challenge. He discusses society's moral confusion over the meaning of death and gives a Christian alternative for care of the dying that is consistent with the strong value that the Christian church has ascribed to human life. 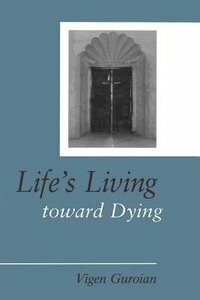 About "Life's Living Toward Dying"
Responding to the current preoccupation with assisted suicide, the author discusses society's moral confusion over the meaning of death and gives a Christian alternative consistent with traditional ascription of value to human life. In the past several years our culture's long-standing prohibitions against suicide and euthanasia have been seriously challenged. A great tidal change in morality and law may be occurring as the courts seem to be creating a new right - the individual's right to die. In the fall of 1994 the people of Oregon voted to legalize physician-assisted suicide; Michigan's courts continue to acquit Dr. Jack Kevorkian for his involvement in the deaths of more than two dozen patients; and in several states federal appeals courts have struck down statutes that prohibited physician-assisted suicide. In Life's Living toward Dying Vigen Guroian responds to this challenge. He discusses society's moral confusion over the meaning of death and gives a Christian alternative for care of the dying that is consistent with the strong value that the Christian church has ascribed to human life. Vigen Guroian (Ph.D., Drew University) is a permanent Senior Fellow of the Russell Kirk Center and professor of religious studies in Orthodox Christianity at the University of Virginia, Charlottesville. Previously he was Professor of Theology and Ethics at Loyola College in Baltimore, Maryland. His many books include The Fragrance of God; Inheriting Paradise and Incarnate Love: Essays in Orthodox Ethics. His most recent release in 2010 was The Melody of Faith: Theology in an Orthodox Key.